In this photo taken Wednesday, Dec. 6, 2017, is one of the elevated sections of the high-speed rail under construction in Fresno, Calif. The board that oversees the California bullet train approved a new business plan for the controversial project this week. The plan says the high-speed train to connect L.A. to San Francisco will be finished by 2033 for a total of $77 billion. 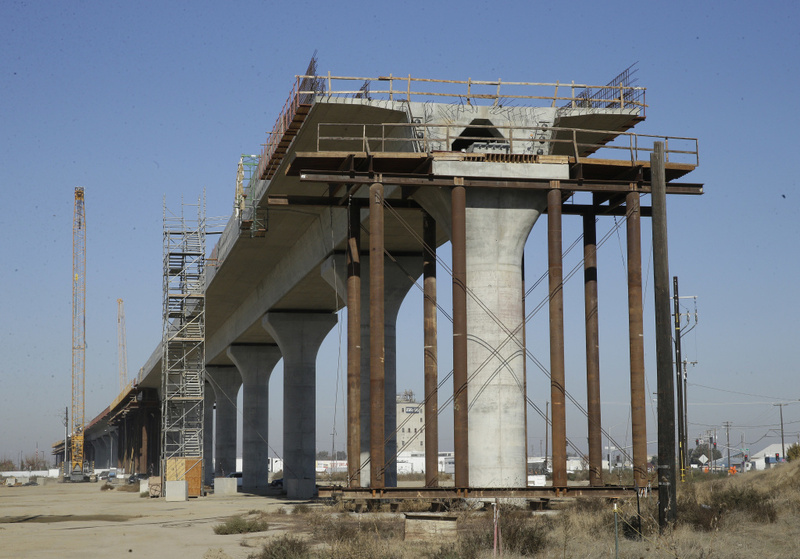 It’s the biggest infrastructure project in state history, but when Californians were first asked to vote on it ten years ago, the price tag was $32 billion less and the timeline for when the train would be up and running was much earlier. Until March, the train was expected to be built and functioning by 2029. In February, the California High-Speed Rail Authority Board of Directors selected a new chief executive to oversee the project. Brian Kelly previously served as the first secretary of the California State Transportation Agency and brings nearly 25 years of transportation policy experience to the position. Kelly told us more about the direction he's taking the massive project. We’re expanding the capacity of the organization to better deliver the project. I brought in a Chief Operating Officer. I brought in a new chief deputy to oversee some of our administrative functions like contract management and other things – and my Chief Operating Officer is focused on delivering our construction projects that are underway in the Central Valley and getting the environmental documents completed statewide. So we have a renewed management focus on really getting the project delivered. This is a unique project in many respects. One of the unique elements is that we got federal money for the project, which is always a good thing, and that came with very strict timelines to spend the money. All the money we received from the federal government needed to be spent by September of 2017 and, in that, I think they entered the construction contracts a little bit early. We didn’t have all of the right-of-way in hand – that is, the parcels that you have to purchase before you can get fully through construction. And I think the biggest lesson we have is we won’t repeat that. I think the next big construction contract that we let, those things will be covered on the front end. So that is a key lesson, because much of the cost driver now is assigning costs to risks that were unknown at the time they went into construction. I’m going to do it like you do almost any other massive transportation or transit project: you do it in building blocks. And what we put in our business plan is recognizing the money we do have. We’re looking at whether we can open a Central Valley line early, expand what we call the “Electrification of the Caltrain Project” in the San Francisco Bay Area down to a city called Gilroy and get those two lines going, and then focus our unfunded needs on a tunnel in the middle. At the same time, we’d finish our environmental work statewide and then we’ll work with local, state and federal partners to find additional funding as we go. My objective and my goal here is to really get the organization delivering – seeing those construction projects in the Central Valley move forward. Get them done under the timelines in our federal grant agreement. And I think if we start to show that success, we’ll be able to expand going forward and we’ll find additional funding as we go. Well, I think that has to be put in context – what [the Legislative Analyst’s Office and the state-appointed peer review committee] pointed out is we don’t have all the money for the entirety of the Phase 1 program, and that has never been the case. The day the voters voted for Proposition 1A in 2008, they provided $9 billion for a project that was estimated at $45 billion – about one fifth of the funding. Today we have about one third of the funding that we need for the project. But they’re right that it’s difficult to build a project without having all of the funding in place. I think people forget that the bullet train got to the ballot under the prior administration, the Schwarzenegger administration back in 2008. So Governor Brown didn’t start the project, but certainly he’s been our best advocate while he’s been the governor. In terms of the next governors, I feel pretty good about what I’ve heard from them. I’ve been doing transportation policy for about a quarter of a century now and I do think this is a very, very important project for the future of the state, and I’m happy to hear that most of at least the Democratic candidates are saying the same thing. Should that happen, I think it would be a sad state of affairs because I think you would stop the economic benefits we are seeing with construction now. You would deprive Californians of the mobility benefits of this project. I guess we’d go back to building only highways and trying to expand more and more car use, and I’m not sure that that’s going to help our congestion, our air quality or our mobility issues in California. The first thing is meet our commitments and perform. And then we look at which assets we can put into use as soon as possible and we move forward in a building block approach. I’ve been doing transportation policy for some time in this state and I’ve never come across a single project than can reduce our travel times, given our choices for traveling today – by car, by current rail options – like this project can. We’re talking about cutting travel times by at least half and mostly more between destination points. That mobility benefit you just don’t get. And the simple truth is, while cars can’t do it, these trains can travel at 220 miles per hour – and that means we can connect cities and connect the state in a way that we never have before. And I’m in love with the economic benefits of this project. I’ve seen what it’s doing in Fresno and the Central Valley, where construction is underway. Two and a half billion in federal dollars invested has resulted in about $6 billion in economic output, and that’s a project that I have no problem supporting and wanting to see in place in California.